Apologies for the absence of the blog over the past few weeks. Life has been, let’s just say, “interesting.” If Arsene Wenger was my manager he would say that I’ve shown incredible “mental strength.” That is to say, I’ve shown hardly any. But the way I see it, I’m such a loyal gooner that I’ve decided to go through a very trying period of my life at the same time as Arsenal have been going through a trying period of their season. True dedication. Today the team travels to Ewood Park to face a Blackburn side that’s struggling. They are currently propping up the table with a solitary point from their four league matches. In two home matches this season, Blackburn have yet to take a single point, scoring just one goal and conceding three. Considering that our domestic revival is comprised of one uninspired home win over a newly promoted side, this is just the opponent we would hope for at this point. That doesn’t mean the match will be easy, but you can’t ask for much more when you need an away win than playing against the side sitting bottom of the table. For me, this is actually a very important match. Not because it’s a chance to regain some momentum. Not because every match in the league is important. I think this is a crucial match because it’s a chance to see how we look when we field our strongest possible XI. Jack and Vermaelen are going to be out for a while. Aside from those two, we should see our first choice team today. Song and Gervinho are back from what felt like an eight month ban. Ramsey looks like he has a chance to start if he passes a late fitness test. Meanwhile, Mertesacker and Arteta should be starting to feel somewhat integrated into the side after two hard fought matches for Arsenal in the last week. All things considered, we won’t have a better team to put on the pitch until sometime in October (April?) when Vermaelen and Jack return. There are no easy matches in the Premier League and a team sitting at the bottom of the table can always be a dangerous opponent. They will be desperate for any point they can get and that means they’ll come out of dressing room ready to battle. But in truth, if we have aspirations of a top four finish, let alone a title, then this is a match we should be able to boss. Attention is always paid to our defensive worries, but I’ll be looking to see whether some of the dynamism returns to our attack today. We’ve looked mostly toothless in our domestic fixtures this season. Ironically, our best attacking display might have come at Old Trafford but I’d suggest that you can’t take anything positive from that performance. I would’ve expected a little more cutting edge against Swansea last weekend, but given some of the absences and the recent arrival of new faces, it was unlikely that everything would click. Especially coming off the confidence sapping loss two weeks earlier. Now, following two decent results, and with the squad looking more settled, I’m hoping for more than just three points today. I’d really love for this Arsenal side to show signs of a true return to form. And if that’s going to happen today, then I think it has to start in the middle of the pitch. In truth, Arsenal have had little fluency in midfield this season. Some of that is down to personnel. We’ve seen Ramsey, Rosicky, Song, Frimpong, Lansbury, Coquelin, Benayoun, Arteta, Oxlade-Chamberlain and even Traore all get a chance to play in midfield and it’s only the middle of September. In order for the midfield to click, the manager needs the chance to pick the same three starters for a few matches consecutively. I’d expect that Song, Arteta and Ramsey will start today if the latter is fit, and I’d imagine that will be the first choice selection until Jack returns. I suppose it’s possible that Rosicky or Benayoun could battle for Ramsey’s place if the Welshman doesn’t find his form, but at the moment, I’d say it’s Rambo’s job to lose. Alex Song’s importance to the midfield and to the team generally cannot be overstated. He gets some stick for his occasional desire to push too far forward and he does have a habit of collecting a few too many foolish cards, but he showed in midweek just how immense he can be. Over the last few seasons, Arsenal’s winning percentage without Alex Song in the lineup has been dramatically lower than when he starts. Today he will play his first game for Arsenal in the Premier League since opening day and I think we’ll see a very different dynamic in midfield now that he’s back. Whatever your current opinion of Cesc Fabregas, I think it’s fair to say that we’ve clearly lost one of the world’s best players. So it’s important not to compare Arteta to our dearly departed Spaniard. They’re not the same type of player, nor are they similar quality. Arteta hasn’t been overly impressive in his first two appearances but he’s shown good determination and discipline. The most disappointing aspect of his play so far has been on set pieces. He arrived at Arsenal with a reputation for being one of the better set piece specialists in the Premier League, but his deliveries so far have failed to impress. Maybe today we’ll see that side of his game come to life. It’s unfair to expect Arteta to fill the void left by Cesc’s departure, but the fact remains that we simply have to get some creativity from the midfield. Lately, most of our attacking play has come from wide positions, which isn’t exactly our strength. Gervinho and Theo give us great pace on the wings, but I’d prefer to see them collecting through-balls played from midfield than trying to beat defenders off the dribble (Theo in particular). Our midfield has to start imposing itself on the opposition. We’ve always been able to do that in the past, but we’ve rarely seen Arsenal dominate the middle of the park this season. 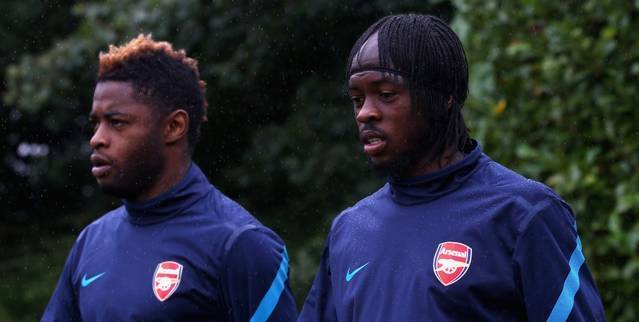 I also have a feeling that today could be an exciting day for Gervinho. He was brilliant against Newcastle but was let down by poor final balls and some disappointing finishing when he did find a teammate in scoring position. Since that match, we’ve seen him shine in Europe but unavailable domestically. He could’ve had a few goals against Dortmund in midweek but was a little unlucky with his finishing. Perhaps today he can put it all together and add a few goals and assists to his already scintillating build-up play. Ultimately, i’d take any three points we can get today. I don’t care if it comes from another scrappy performance or a classic Arsenal masterclass. But at some point you have to accept that your eyes don’t lie. If we struggle to break Blackburn down, we may have to acknowledge that this Arsenal side has some offensive deficiencies. You don’t lose players like Samir Nasri and Cesc Fabregas without suffering. And even with those two in the lineup last season, we saw our attack sputter during the run-in. Now they’re gone. Gervinho and Arteta are excellent players, but the proof is on the pitch. Have you seen a single performance from Arsenal in the Premier League this season that suggests this team has the attacking flair we’ve come to expect from an Arsene Wenger side? I don’t think so. But I think it’s also fair to suggest that we haven’t been able to put anything like our first choice XI on the pitch. Today we’ll come as close as possible, and hopefully we’ll see the difference. Personally, I’d feel a lot more confident about where this season is heading if we saw a classy attacking display and a comfortable victory. It’s still far too early to be looking at the table, and probably premature to worry about other teams’ results. But the fact remains that with Liverpool playing Sp*rs and United hosting Chelsea on Sunday, we have a chance to gain some important ground on a few of our rivals if we get the job done today. Amazingly, seven points from five matches could still be good enough to keep us above Sp*rs, level with Liverpool and within three points of Chelsea. All things considered, that’s not so bad. Here’s to a win and, since I’m feeling greedy, a performance that makes a statement. Why have you abadoned such amazing blog?